Bogoli Pulao is possibly our favourite amongst the classic rice dishes of Iran. You can read the recipe for the original dish here. In this version it becomes a ridiculously moreish salad. OK, so it’s not the broad bean season yet. But hey – I made this with frozen baby broad beans and it was just scrummy. And as it flies out of our deli counter, it seemed mean not to share the recipe right here right now. Easy peasy. Rinse and then soak the rice for around half an hour – brown basmati is just that little bit more resistant to cooking than white. Drain off the water and then add butter + salt and cook according to your preferred method (have a butcher’s over here for some pointers if you like). Stir the dill through it, and then drizzle it with the saffron and set aside to cool. Next blanch the broad beans in boiling salted water: 3-4 minutes should do. Drain and again set aside to cool. Now toast the seasame seeds: rub a frying pan with sesame oil, and then toss the seeds over a fairly strong flame until they start to turn golden brown. Turn them out onto some kitchen paper and set aside. Time for the dressing. Whisk the tahina, olive oil, lemon and seasoning together until they form an emulsion: add a little cold water if it looks too thick. 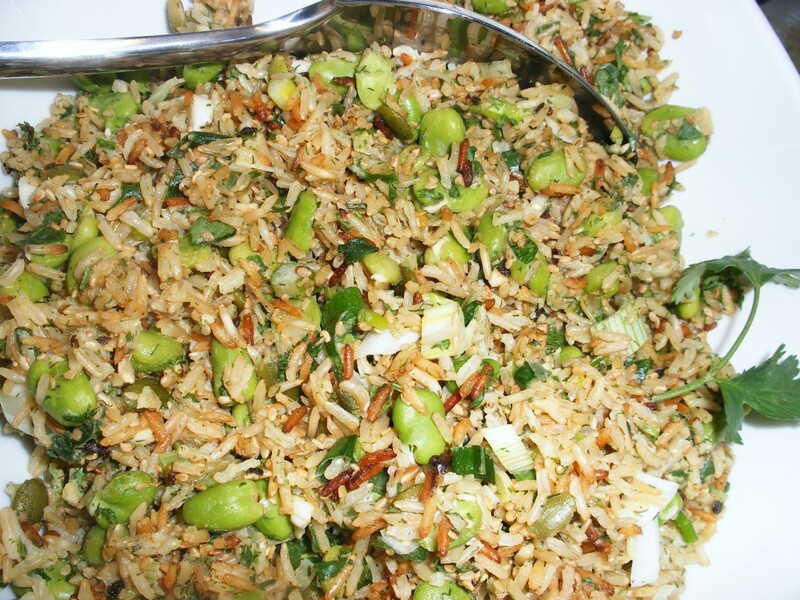 When the rice is cool, stir in the broad beans, sesame seeds, spring onion, pistachios and coriander. Pour the dressing all over it and mix well. Check the seasoning and chill until required. Real veggies look away a moment. If you do eat fish/meat, this salad works very well with some shredded chicken breast or chopped ham or prawns up it. This entry was posted in Recipes and tagged broad beans, brown basmati rice, rice salad, salad-e-bogoli pulao, sesame seeds, tahina. Bookmark the permalink.